Be Gentle, Be Kind Matcha + Apple Replenishing Superfood Shampoo is the perfect addition to your everyday wellness routine. This nutrient-rich, green juice-inspired shampoo, is formulated to visibly replenish dull and parched locks with a super-charged boost of vitamins and hair healthy ingredients. By harnessing the power of fruit and vegetable fatty acids, vitamins, and minerals, this shampoo helps to support the vibrancy and strength of hair. This SLS-free formula won’t strip hair of moisture, and is color-safe. What It Is: A nutrient-rich juice-inspired shampoo and conditioner that harnesses the power of fruit and vegetables to support healthy hair and scalp. Who's It For: Those with dull, lifeless, and dry hair that are looking to supplement a healthy diet with a parallel hair care regimen. What It Does: This mega-green shampoo and conditioner is packed with potent levels of omega fatty acids, potassium, calcium, iron, magnesium, antioxidants, and vitamins which all create a crucial foundation for healthy hair. This innovative formula combines the most vital fatty acids and fruit & vegetable extracts that address the root cause of dull, dry, and lifeless hair – lack of hydration. This product concept Superfood duo blends the idea of “you are what you eat” with “your hair is what you put on it”, encouraging a healthy, 360° lifestyle. Suggested Usage: Apply to wet hair and vigorously massage for 30 seconds as the lather builds, then rinse. 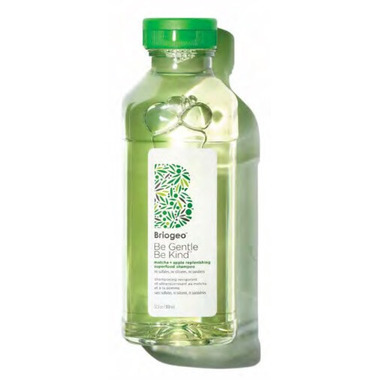 For best results, condition with Be Gentle, Be Kind Kale + Apple Replenishing Superfood Conditioner. Kale: Rich in both Omega-3 and Omega-6 fatty acids. Spinach: Contains potent levels of potassium, calcium, iron and magnesium, which help to support a healthy scalp. Apple: Rich in procyanidin which is essential for healthy hair. Vitamin C: A powerful antioxidant. Great shampoo, not too harsh on my fine curly hair. Doesn't dry it out and it smells divine! 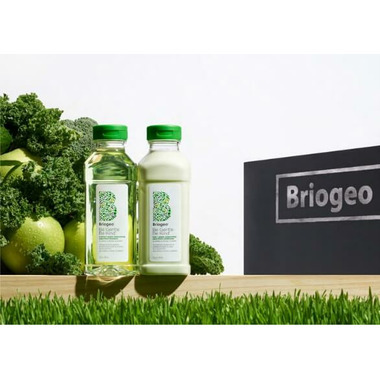 Love all Briogeo products! This is the best shampoo I have used. Keeps my hair soft and clean, but doesn't dry it out. I've also noticed less frizziness, too. This is the only sulfate free shampoo that actually lathers well. Smells sublime! I have always struggled with embracing my natural curly hair. My hair had always been super dry and my curls were flat and frizzy. I figured I would give this a try and was SHOCKED by how fast I noticed results. After the first wash I noticed a difference. My hair was shiny and my curls had been completely revived. My curly hair was something I had tried to fight with straighteners and curling irons for years. Now I feel my hair has reached a new potential and I can finally embrace my natural hair.